A month or so ago we bought a package of veal liver at our local grocery store telling ourselves that we going to cook them, but not really having any idea how. We’ve made veal kidneys before without relying on a recipe so we were convinced we could do the same with the beast’s liver, but when we got home we found ourselves bereft of inspiration, and we put them the freezer and they there stayed until recently when we realized that we must figure out something to do with them. Inspiration is overrated, so we abandoned our search for it, opting instead for a simple breading and pan-frying approach. 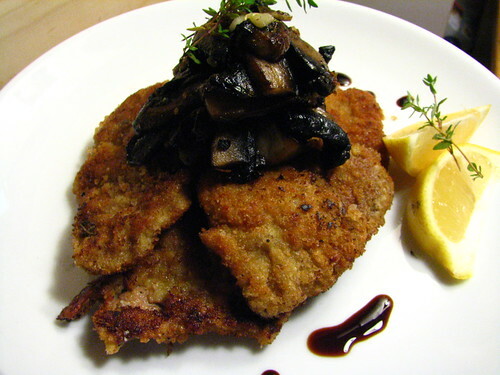 You’ll notice that this dish kind of resembles a veal milanese in appearance, and it does, just don’t pound the livers or they’ll split and become purple goo. Because of this resemblance, as I was making it I was thinking of the great breaded sweetbreads we ate at Prune, and at the same time, I imagined this dish would be the perfect kind of thing to have for lunch on a cold, foggy day after a brisk walk in the rolling hills of Piemonte, and washed down with a gentle nebbiolo. And that might be the case, but it was just as good with a cold beer after a miserable rainy day trawling around Manhattan in search of baby gifts. Chop mushroom roughly into chunks and saute with garlic until soft but still al dente. Sprinkle with thyme and remove to a warm plate. Garnish with lemon slices and good balsamic vinegar. Enjoy! Another adventurous dish. I thought at first that the portabella top was the liver till I read on. Baby gifts…is there an announcement on the way? HA!! no announcement from us yet. just buying baby gifts for everyone else in our lives that just had kids! but thanks for actually showing us that you read our posts all the way through! yes, this dish was a bit adventurous, but honestly, veal liver is not very costly. i would dare anyone to just give this a try. it is actually not as adventurous as most would think – i think liver just scares some. but i was totally blown away by how simple and tasty this dish was. jonny whipped it up b/c we needed to use them up and the next day i bought more for the freezer so we can make this a weeknight meal with a salad. honestly… give it a try! I love liver, but here we are lucky to find calve’s liver let alone veal liver! You found a real treasure, and with liver, simple is better, and timing is essential.Most people who hate liver had it cooked to the shoe leather stage! Saying that I’m not fond of liver would be an understatement, but this does look quite good! HAha, liver…you dared and did it! I try & revisit eating things I don’t like each year…next time set up a seat for me, I’ll give it a go again. Hmm. I can’t say I’ve had any sort of liver for years. But, veal liver… does this require a rethinking of my former opinions of regular old beef liver?! Looks delicious. So, you’ve got me thinking. liver is definitely an acquired taste, but so is camembert, truffle, fenugreek, bitter greens, and a host of other things that many foodies claim to love, so why not acquire the taste for liver too? If we only ever ate things that tasted good the first time we ate them, we’d all eat nothing but potato chips and chocolate. veal liver – it’s the future. Oh how lovely, lovely, I love food like this…grew up on it. Beautiful presentation. I love liver. There’s just something about it. I’ve never eaten it breaded, but looks dy-no-mite! I’d never seen liver prepared this way, but it sounds like it would be delicious. I’ll have to try it out. Also, there’s something be said for anyone who can make a photo of any liver dish look so attractive! and isn’t that the purpose of all of this? That sounds really interesting, I’ve never had veal liver before! my husband is seriously considering liver for dinner tonight and this makes me feel like I might agree to it. How decadent!! I for one find this extremely inspiring! You know liver is something I have come to appreciate as an adult. I love this version. I absolutely love liver! I used pretty much the same method as yours frying it but without dipping it into eggs. Will try with eggs next time. Sounds great! Love, Love liver! But i need to find this veal liver. You made it look fabulous….wow, I need a bite very badly. 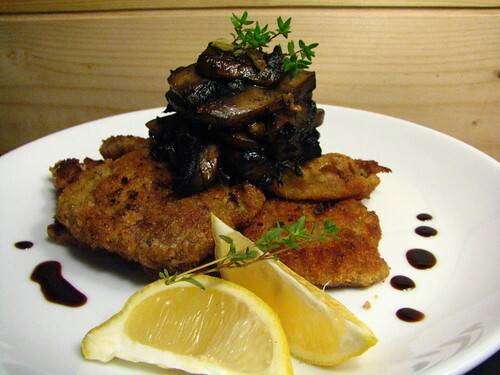 The portobello mushrooms are an amazing touch too, so earthy and comforting. ok. I am inspired, I have a particular weakness for veal liver and a good supply here in Rome. you could add some pancetta, you know, make it vegetarian friendly!!!!!!!! ha ha ha ha ha… rachel, you’re funny! Ahhh…. reminds me of Rome. I had veal liver with crisped sage leaves and browned butter at a little diner in Rome a few years ago. It was heaven! Yours looks fantastic. ← What’s Long, Beige and Delicious? Homemade Bratwurst, Fool!